The question whether Barbara Uttmann, of Annaberg, Saxony, was the inventor of the art of making hand cushion lace, or only introduced it into Annaberg, in the Saxon mountains, has not yet been solved, notwithstanding the fact that the most rigid examinations have been made. It is the general belief, however, that she only introduced the art, having learned it from a foreigner in the year 1561. The person from whom she acquired this knowledge is said to have been a Protestant fugitive from Brabant, who was driven from her native land by the constables of the Inquisition, and who found a home in the Uttmann family. However, the probability is that what the fugitive showed Barbara Uttmann was the stitched, or embroidered, laces—points, so called—which are still manufactured in the Netherlands at the present time. It is very probable that the specimens shown induced Barbara Uttmann to invent the art of making lace by means of a hand cushion. Very little is known of the family of Barbara Uttmann, which was originally from Nurnberg; but members of the same migrated to the Saxon mountains. Barbara's husband, Christof Uttmann, was the owner of extensive mines at Annaberg, and was very wealthy. She died at Annaberg, Jan. 14, 1584. The art of making hand cushion lace was soon acquired by most of the residents in the Saxon mountains, which is a poor country, as the occupation of most of the inhabitants was mining, and it frequently happened that the wages were so low, and the means of sustaining life so expensive, that some other resource had to be found to make life more bearable. Barbara Uttmann's invention was thus a blessing to the country, and her name is held in high esteem. A monumental fountain is to be erected at Annaberg, and is to be surmounted by a statue of the country's benefactress, Barbara Uttmann. The statue, modeled by Robert Henze, is to be cast in bronze. 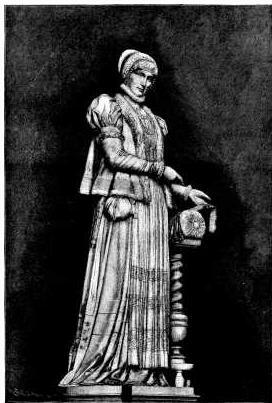 It represents Barbara Uttmann in the costume worn at the time of the Reformation. She points to a piece of lace, which she has just completed, lying on the cushion, the shuttles being visible. Some point, Valenciennes, and Guipure laces are made on a cushion by hand, with bobbins on which the thread is wound, the pins for giving the desired pattern to the lace being stuck into the cushion. A yard of hand cushion lace has been sold in England for as much as $25,000. The annexed cut, representing the Barbara Uttmann statue, was taken from the Illustrirte Zeitung. A Boston paper tells of a man who built two houses side by side, one for himself and one to sell. In the house sold he had placed a furnace against the party wall of the cellar, and from its hot air chamber he had constructed flues to heat his own domicile. The owner of the other house found it very hard to keep his own house warm, and was astounded at the amount of coal it took to render his family comfortable, while the "other fellow" kept himself warm at his neighbor's expense nearly a whole winter before the trick was discovered. Knyppling? Är inte så bevandrad i det engelska språket att jag med bestämdhet kan veta att det var just det Barbara lärde sig. Jag har visserligen bara hört pillow-lace och bobbin-lace om knypplade spetsar - men kudde som kudde! When I visited Bruges in Belgium, one of the most popular visitor attractions was an elderly woman, wearing traditional costume, seated outside her house making lace on a cushion. She chatted away about it while her hands flew, making the most exquisite lace. Your story of the heating cheat has me laughing aloud. With today's prices for oil, electricity or whatever fuel you use - it is tempting to do share your neighbor's heat! Unfortunately it's quite a distance to nearest neighbor! I like to make lace - but I'm not fond of it, and very seldom need any.